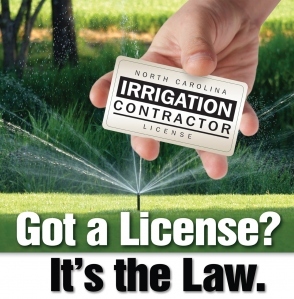 The North Carolina Irrigation Contractors’ Licensing Board was established by legislation January 1, 2009. The Board oversees the licensing of Irrigation Contractors in North Carolina. The purpose of licensure is to protect the public health, safety and welfare, and to promote the efficient use of water. The new licensure law became effective on June 30, 2009. According to the licensure law, no person shall engage in the practice of irrigation construction or contracting, use the designation ‘irrigation contractor’, or advertise using any title or description that implies licensure as an irrigation contractor unless the person is licensed as an irrigation contractor. All irrigation construction or contracting performed by an individual, partnership, association, corporation, firm, or other group shall be under the direct supervision of an individual licensed by the Board. To act with honesty, integrity, and fairness towards clients and the general public. To respect and be courteous to colleagues and other professionals in the industry. To avoid all conduct or practice that deceives the public. To perform services only in the areas of their competence. To follow Minimum Standards in irrigation design, installation, and service and to promote Best Management Practices adopted by the NCICLB. To be environmentally responsible with design, installation, and service. To protect the environment and the safety, health, welfare of the public. To adhere to local, state, and federal laws that apply to the irrigation industry. To promote water conservation practices on a continual basis. To maintain professional competence through annual continuing education and professional development activities.